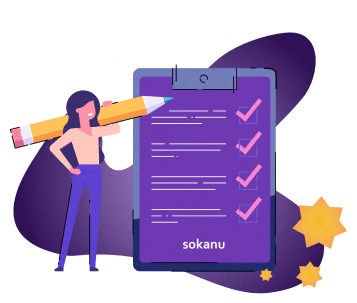 At Sokanu, we’ve spent a lot of time thinking about career satisfaction, and lately, we’ve spent even more time thinking about what exactly makes someone satisfied in their career. We know that although every role within a career is unique, some careers overall just tend to have happier workers. 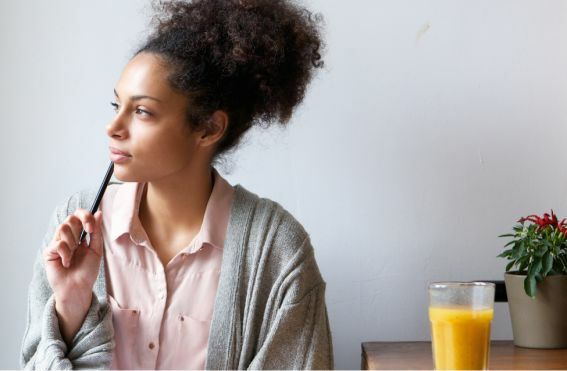 Yet even among careers with the lowest reported levels of satisfaction, there are some who are happy with their jobs, and among careers with the highest reported levels of satisfaction there are some who report being profoundly unhappy. There isn’t a single most, or least, satisfying career for everyone. Whatever aspects of a career led a person to pursue it aren’t necessarily the same things that keep them happy in it. The medical doctor profession, for example, is one of the most competitive professions to enter into, with fewer opportunities than there are interested people. Even so, doctors have consistently been found to be some of the unhappiest workers. The reality of the profession is different than the idea of it. This is the fundamental difficulty. Career choices are often made based on interest, but the real goal is to find a career that satisfies. How can a person choose a career that both interests them and would satisfy them when they can’t determine satisfaction until they’ve already made their choice? This isn’t to say that interest and satisfaction are at odds. It’s intuitive that you’re unlikely to be satisfied by a career that you aren’t interested in, but we know from the data that we collect that there are often gaps between reported satisfaction and interest. Consider for example how the mean interest and satisfaction ratings are distributed across all 814 careers in Sokanu’s database. Overwhelmingly, people report being more satisfied with careers than we would expect if we thought that career interest and career satisfaction were equivalent. It’s possible that this is purely an artefact of satisfaction being biased. Sample bias could be misleading us into overestimating the difference between satisfaction and interest. By definition, the only people who can can judge their satisfaction in a career are those that have actually worked in it! If high interest did lead to high satisfaction, then we should expect to see the type of plot above. The people who rated careers low for interest don’t ever get a chance to report satisfaction, so satisfaction ratings would be inflated. Even so, there are levels of reported satisfaction far exceeding levels of reported interest. There is a second explanation. It’s also possible that satisfaction is influenced by more than the factors that drive interest. Perhaps people generally don’t understand the reality of a career or perhaps they misjudge how they’d react to what they do know about. For example, maybe a person becomes a civil engineer because they love urban planning and physics, but they wind up unhappy in their job because they didn’t realise most of their time would be spent at a desk. Or maybe a person becomes a personal trainer because they enjoy health and fitness, but realise that it’s the entrepreneurial aspect of the job that helps them truly love it. If this is the case, then we should see evidence of it in models we create to predict interest and satisfaction. We’ve been working to develop models to predict both career interest and career satisfaction. Using the data provided by users that take our assessment, this helps us to identify which careers would be most satisfying for a user and where the biggest differences are with what would be interesting. Maybe most importantly, we can also start to figure out what drives interest and what drives satisfaction. This part gets a little technical, so if you just want the punchline of why we think we’re seeing differences in interest and satisfaction ratings, feel free to skip ahead to the next section. 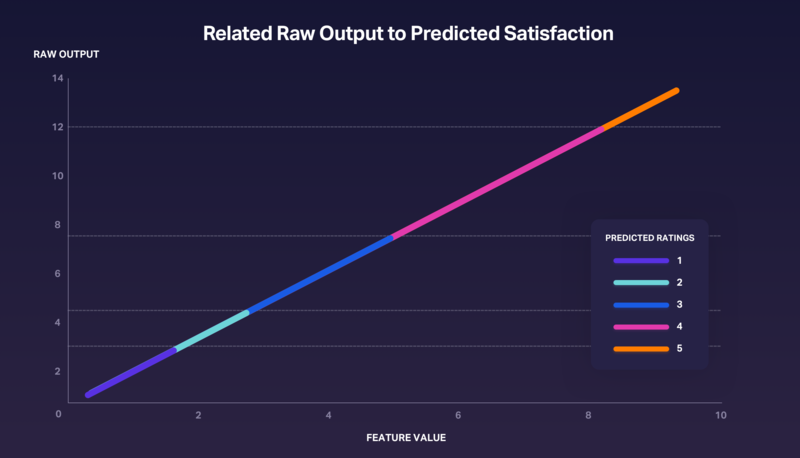 This part gets a little technical, so the TLDR for anyone who wants to skip this section is that we can use the model to get a sorted list of factors in order of their importance to predicting either interest or satisfaction. 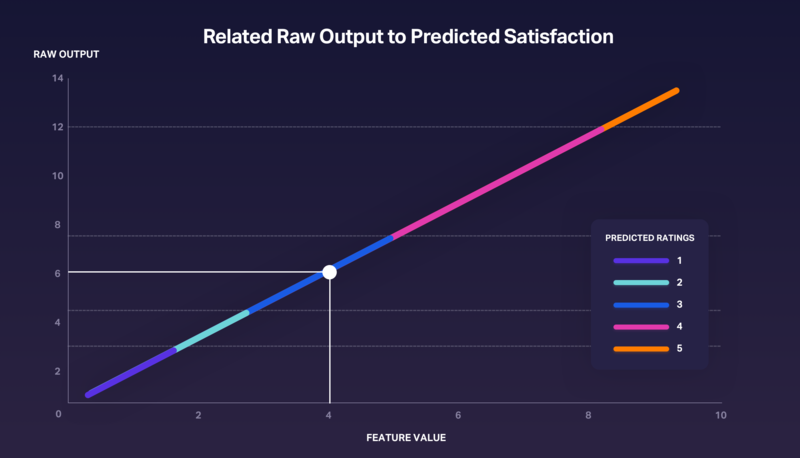 Users provide ratings on a scale from 1 to 5, so one of the ways we can model user responses using ordinal regression, which is useful when the responses being considered are on an ordinal scale (i.e. a user responding with either a 3 or 4 makes sense, but a 3.5 isn’t allowed). Ordinal regression works by combining all of the features linearly into an output, not unlike linear regression. This of course doesn’t make sense as a predicted rating, so our model needs one more ingredient. Along with the weights, the model learns a set of four thresholds. Thresholds turn the raw output into a rating from 1 to 5. Given a raw output like 6.3, the predicting user rating is the number of thresholds 6.3 is greater than plus one. So if our four thresholds are -1, 0, 2, and 8, we would predict a 4, since 6.3 is bigger than -1, 0, and 2, but smaller than 8. If we have our four thresholds at 3, 4.5, 7.5 and 12, then the prediction function would look like the below plot. The white line represents how we relate the input 4 to the raw output 6. Since 6 is bigger than two thresholds and smaller than the other two thresholds, we’d predict 3. The important point is that, given a data set, our model learns the optimal weights and thresholds to predict ratings. The features that are positively associated with a high rating get large positive weights to help push the raw output up and hopefully above most of the thresholds. Conversely, the features that are negatively associated with a high rating, get large negative weights to pull the raw output down, ideally below most of the thresholds. Each weight pulls the raw output a certain amount based on a user’s responses, and the raw output eventually settles among the thresholds. Now onto the real thing. 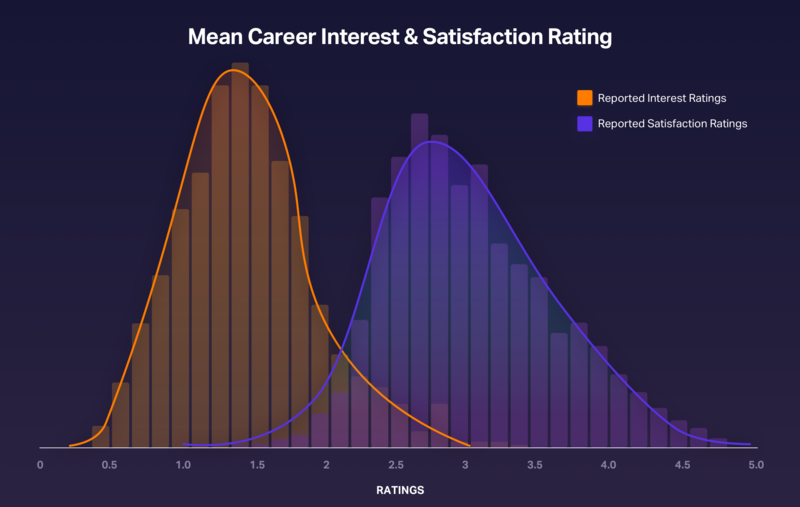 We looked at the overall interest and satisfaction across careers, and with the models that we introduced above, we can start getting insights into different careers by discovering what’s driving the differences. One of the most interesting careers to consider is nursing. Visitors to Sokanu on average give an interest rating for nursing of 2.32, which is relatively close to the average satisfaction of 2.78 that’s reported for the career. Nursing as a profession though sees lower satisfaction scores than the majority of careers we have data on. Interest in interpreting the results of medical tests. Interest in helping people with disabilities with activities like getting dressed. Interest in helping elderly people complete their daily activities. Interest in teaching kids to play well with other kids. These are all positively associated with an interest in nursing, which makes a lot of sense. We expect that a nurse should be interested in healthcare and the activities associated with it, and they should enjoy spending time with more vulnerable groups within the population, since they’ll likely see them more often. These again are all positively associated with an interest in nursing, but there are a couple key differences from the interest case. For one, some of the more obvious day-to-day tasks are de-emphasized, as seen from an interest in interpreting the results of medical tests being bumped down to number four. A desire to work with more vulnerable populations is still represented by an interest in helping elderly people complete their daily activities, but we also see an arguably more holistic representation of a nurse’s duties from the presence of factor five. Nurses are often the face of the hospital when it comes to patient care, and so they tend to see people in their most difficult time. Our model tells us that a willingness to maintain a positive attitude and cheer patients up can play a major role in job satisfaction. A second big takeaway is that satisfaction data might be better at capturing internal motivation.  Factor three, a desire to help people, didn’t appear in the list of traits important to interest in nursing and has nothing to do with the specific daily tasks of a nurse. Instead, it relates to internal motivation. Nursing is a demanding job, both physically and emotionally, and an internal desire to help people can motivate and keep nurses happy throughout the career’s challenges. For a person to be satisfied with their job, it makes complete sense that they need to feel that they’re doing meaningful work. The ability to distinguish between interest and satisfaction represents an enormous opportunity for Sokanu. By leveraging the massive amount of data we have on what drives satisfaction and interest, we can start to help people isolate the most important qualities that will allow them to be happy in their careers long-term. There are interesting things in the pipeline here, so stay tuned and check back often.